For the first time, the Friant Water Authority has a city among its membership, and it is the Friant Division’s largest Central Valley Project municipal and industrial contractor as well. The City of Fresno, with its population of just over 500,000 people, has officially become the 21st FWA member . Its representatives took part fully in their first Board of Directors meeting February 27 in Visalia. 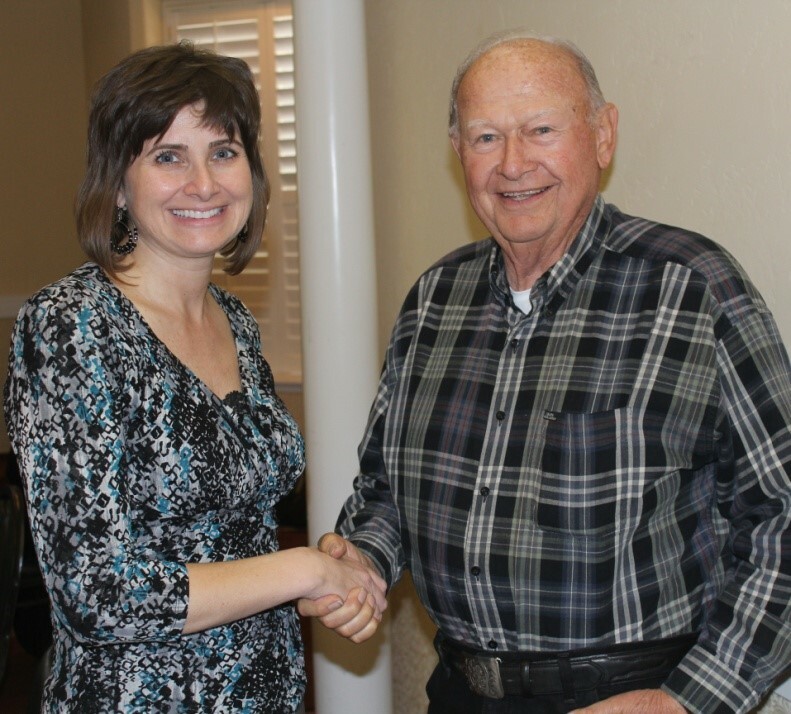 Georgeanne White, Chief of Staff to Fresno Mayor Ashley Swearengen, is welcomed to the Friant Water Authority board February 27 by Chairman Harvey Bailey. Seated as Fresno’s FWA Director on behalf of Mayor Ashley Swearengen was the Mayor’s Chief of Staff, Georgeanne White. Also taking part was Martin Querin, who manages the city’s Water Division. Both were welcomed by FWA Chairman Harvey Bailey. Fresno has a contract for 60,000 acre-feet of Class 1 CVP water, which is delivered to the city’s surface water treatment plant and groundwater recharge facilities by the Fresno Irrigation District, also a Friant contractor. Much of the city is within FID’s boundaries and is entitled to receive Kings River water that formerly flowed to pre-urbanization farmland. “We are delighted to have the City of Fresno as part of the Authority,” said Ronald D. Jacobsma, FWA General Manager. Several other cities and towns – Friant, Orange Cove, Lindsay, Strathmore and Terra Bella – rely on CVP water for most or all of their municipal water supply. The FWA is a joint powers authority organized under California law. The Authority operates and maintains the Friant-Kern Canal under agreement with the U.S. Bureau of Reclamation for all contractors, and represents its members on water issues.